Peterson moth guide update, and a contest! We have a cover! AND a publication date! I’ve been away since last Friday, visiting my sister, and have been only minimally checking in with email. (Also the reason for the lack of posts; I did have my computer, but it’s harder to find the time to organize a post when away from home.) We received the official cover earlier this week, and I got the okay to share it with all of you – so here it is! 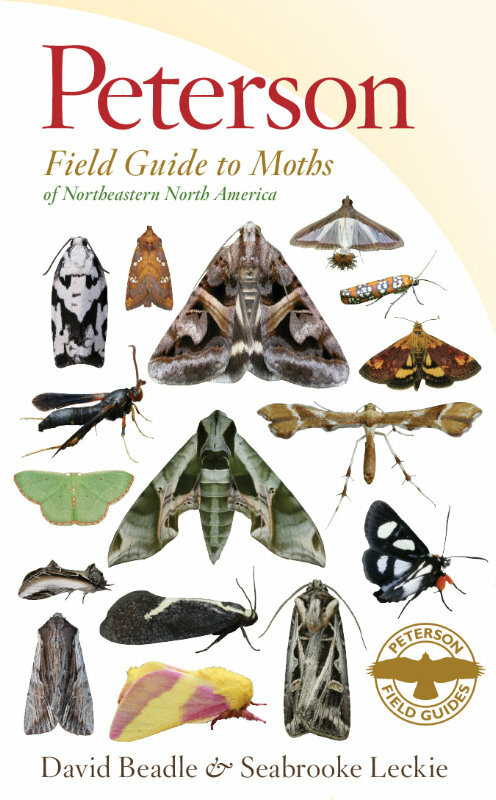 The new cover of the Peterson Field Guide to Moths of Northeastern North America! The Peterson field guide series is undergoing a small makeover, the most prominent difference being the covers of the guides. The bird guides have one of Roger Tory Peterson’s beautiful paintings on them, but the rest of the titles in the series will be a mosaic of an assortment of species from the guide plates. All of the images you see here are the actual images that will appear for those species on the identification pages of the guide. There are 16 species of moth on the cover. Tell me what they all are to be entered into a drawing – when the book comes out next spring, I’ll send the winner a free signed copy of the guide. If you don’t know them all, you can send me a partial list. Common names are fine, but please include Hodges # and/or scientific name to make sure we’re both thinking of the same species. You’ll get one entry into the drawing for every 4 species you guess correctly. If you need an identification reference to look them up, this website can be very useful. If you need/want to see a larger version of the cover, click here. Which brings me to the second half of the announcement. The publication date for the moth guide has been officially set for April 3, 2012! A few online retailers already have pages up for the guide. If you’re the sort to like to take care of these things early so you don’t forget, you can now pre-order your copy from Amazon.com (other sites have pages but no pre-order option). Finally!! It’s been such a long wait, but it will be such an awesome guidebook. Congratulations, Seabrooke. I’ll work on an entry to the contest. Cool! I only recognize a couple of them off the top of my head, but I’ll have to see if I can find the time to ID the others. Matt and I are SO psyched about this! Congratulations, you really have put your heart and soul into this and it must feel great to have the official result in sight! That did occur to me, too, Heidi. ;) Fortunately, there are a few resources out there, even if they’re not as convenient as the guide will be. Yay!!! I just pre-ordered it! I recognize some of the moths on the cover but not all. I’m going to print it and work on IDing the rest. Nice news. I’ve placed a link to it on the Moth Field Guide page of my website. Hope it brings in lots of business. Thanks, everyone! We’re really excited by how the book’s progressing. It’s great to see how much anticipation there is for it, too! That looks good. The brown jobs of old, baring Birds, always were a bit boring. Looking forward to this one particularly. What species will your book cover that aren’t covered in Covell’s __A Fild guide To The Moths Of Eastern North America”? I couldn’t tell you exactly for the macromoths, Vincent, but Covell only offers a very cursory treatment of the micromoths. We’ve included close to 600 micromoth species in our book, and over 900 species of macromoth. Covell had just under 1300 species total, but this included a number of more southern species that won’t be in our guide because they don’t occur, or don’t occur widely, in our range. Ours will be a more comprehensive treatment of the moths that occur in ne. North America. For example, Covell illustrates one species of Xylena swordgrass, while we have three; he shows eight species of Lithophane pinion, while we include fifteen. I’ll take a swing at the 16 identifications, and when I score the worst you’ll probably send the copy to me, as clearly I will be in the greatest need!